Review: As I write this review I am torn. I really wanted to "love" this book. I picked it up a few weeks ago because m eyes were immediately drawn to the beautiful cover. I know, I know... "don't judge a book a book by it's cover" but come on! who doesn't? lol. The deep purple and blue flames illuminate the cover and drew me in. I read the synopsis which sounded to be a thrilling book. And for most of Wildefire, it was just that! Thrilling. Sometimes, even captivating. Ashline Wilde and her sister Eve are both adopted. And while there are many differences, there is also a huge similarity that ties them together. Karsten's dialogue and character expressions are wonderful. Although Eve is supposed to be this villain character in the book, I enjoyed reading the vicious banter between her and her younger sister Ashline. Ashline tries to leave the past behind her and believes she does, until her sister whom she hasn't seen in months continuously shows up. Eve is one of those people that even if they tell you they won't do anything wrong... nothing ever good ever comes about hanging around them. The characters are great! I especially enjoyed reading about Serena- a blind girl- who isn't much different than the characters in the book that she summons. I just wish that she would've played a bigger role in the end of the book, like I thought she would. The boys--- hmm... where to start.... besides the fact that boys are boys, I think I could easily find myself going after both Colt and Rolfe. Colt is sweet. And Rolfe is a joke-ster. And in the end I was surprised, saddened, and shocked by the storyline that involves both of these characters. 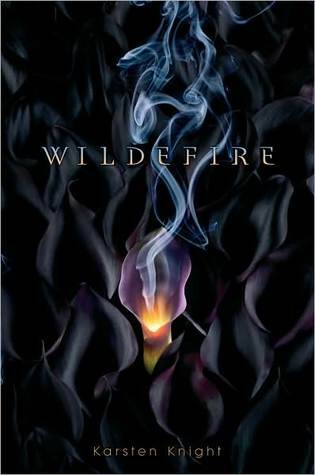 I thought the first half of Wildefire was "good"... not great or awesome. Just good. It took a while for the book to really get going. The chapters were long (which usually I enjoy- but here I felt as though they kept dragging on) and the breaks felt jumpy. It was sometimes hard for me to focus on what was actually going on at that certain moment. I don't want to sound as though I'm bashing this book. Because in all honesty, it was good. And I think others would enjoy it. There were some inconsistencies and ideas that did not catch my interest right away. With that being said, the last half. I loved!! The author Karsten Knight started revealing parts of the plot that were exciting. The reader finally was able to understand what was going on with the characters. Maybe I was just being impatient, but I would've loved if Karsten went even further with the main characters and we understood their "god-like" powers a little earlier on. I didn't like it. It had great potential & I think his idea was really good, but for me he didn't deliver it :( Probably one of the worse books I've read this year, but that's just me. I loved this book! It was one of those that you either like or don't like. I haven't read this yet, but I've seen a lot of similar reviews. I guess it depends on the person! I see why you didn't love this one - great review :).